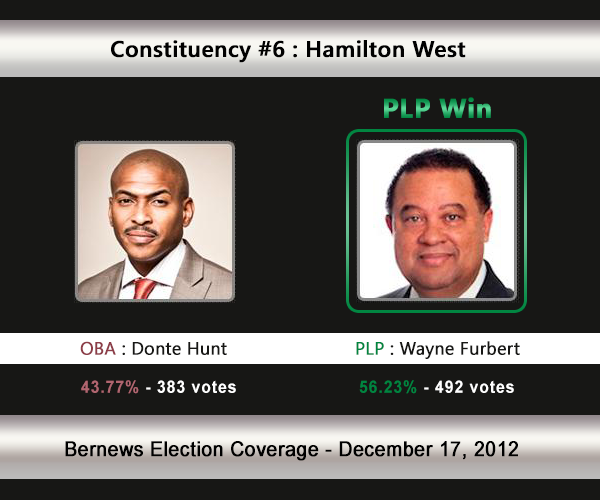 [UPDATE Dec 17: Election Results] Incumbent Wayne Furbert [PLP] has defeated Donte Hunt [OBA] in C#6 Hamilton West. Mr Furbert won the seat under the UBP’s banner in 2007. This area will be watched by many political observers to see if the former Opposition Leader Wayne Furbert — who switched allegiance to the PLP and now serves in Cabinet — can maintain his seat against a challenge from the OBA’s Donte Hunt. In the 2007 General Election Mr Furbert [under the UBP] won 54% of the vote vs the PLP’s Charles Clarke [530-451]. In the 2003 General Election, Mr Furbert won with 53.23% of the vote against Wilbur Lowe [PLP] who received 46.77%. 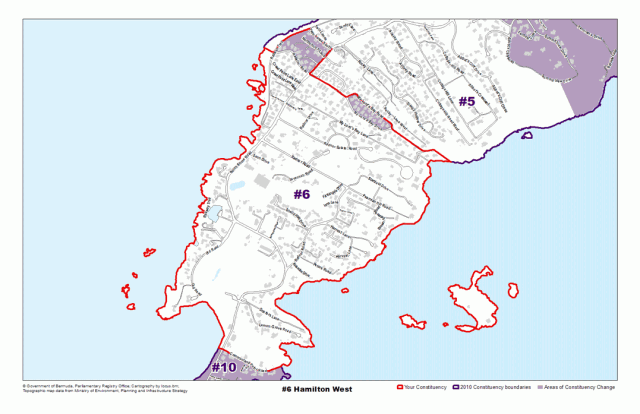 Areas Hamilton West compromises, or is located by, include Redkiln Lane, My Lord’s Bay Road, the Railway Trail and also islands such as Collins Island, Rabbit Island, Crow Island and Trunk Island. Wayne L. Furbert became interested in public service as a boy while hearing stories about his great-great-uncle, Earnest Furbert and his great, great, grandfather, W.B. Furbert, who served Hamilton Parish as Members of Common Wealth Parliament. Following their example, he has persevered through all tribulations to accomplish his mission to transform Bermuda into a place of peace, progress and prosperity for all. He was educated at Francis Patton School, Bermuda Technical Institute, and the Sixth Form Center, before going off to The University of Toledo. Wayne excelled in Mathematics and Physics and was invited to join the Mathematics Honor Society. He graduated with a Bachelor of Science and a Bachelor of Education degree. Later he received a Master’s Degree in E – Business. He currently is pursuing a Doctoral Degree in Business Administration. Mr. Furbert was first elected in 1993 to represent Hamilton West as a Member of the United Bermuda Party (UBP). He served in several Ministries from 1993 – 1998 as Minister of Community and Cultural Affairs, Minister of Transport and as Minister of Housing, Health and Social Services. The son of Allan and Mildred Hunt, Donte was schooled at Francis Patton, the Berkeley Institute and Bermuda College before attending North Carolina State University, where he earned a degree in business administration. Donte worked in the banking and finance industry for over 10 years. Today he is a small business entrepreneur. In 2007, Donte was elected to represent the people of St. George’s South, a seat previously held by former PLP cabinet minister Renee Webb. Donte presently serves as the Shadow Minister for Community Development.Donte is a strong advocate for family values and community service. He finds his greatest joy pending time with his wife Kelly and their two young daughters,Annalise and Laylah. From the time he and his wife studied post graduate theology together in Toronto, Donte knew that serving people was his calling. Donte says, “I have spent the past four years representing and serving the great people of St. George’s South. But at the next election I will seek the support of the people of Constituency #6,Hamilton West where I was raised.” “I am supported in my goals by my colleagues in the One Bermuda Alliance, who are equally committed to making sure Bermuda and its people flourish and succeed again. The OBA believes Bermuda needs to change if we are to overcome the challenges Bermuda faces”. Donte was born in Bermuda in 1977 and is the second son of Allan and Mildred Hunt. He was schooled at Francis Patton, the Berkeley Institute, Bermuda College and North Carolina State University where he earned a BA in Business Administration. After he was married, Donte and his wife attended Tyndale College and Seminary in Toronto, Ontario where they studied Post Graduate Theology. Donte has worked in the banking and finance industry for over 10 years. He currently owns his own business, where he utilises his background in management and finances as a savvy restaurateur. Donte is passionate about family. He believes that the strength and ultimately the success of a nation is rooted in the strength and the health of families. He strongly feels that all aspects of family life (parenting, relationship development / management etc.) deserve the highest level of support, nurturing, celebration and encouragement by both the community and the government. When the time is right, Donte and his wife intend to realise their dream of using the knowledge gained from their Seminary studies and their passion to serve others by endeavoring on missionary adventures. Donte is the father of two young daughters. He finds his greatest joy and fulfillment spending time with his wife Kelly and their two young daughters, Annalise and Laylah. Currently Donte volunteers as a Sunday School Teacher at Holy Trinity in Hamilton Parish. He has also served as the National Director of the Duke of Edinburgh Award, where he was responsible for raising the Award’s profile, increasing participation and raising funds. In 1998, Donte’s passion for helping others saw him head to Uganda for 3 months with Operation Raleigh. During his time in Uganda, Donte helped to build medical centres on Mount Elgon and assisted the Ministry of Tourism with constructing a bird hide (a camouflaged bird observatory shelter) in the Queen Elizabeth National Park. In 2007, Donte was elected as a representative for Constituency # 4, St Georges South..
Let me first congratulate you for all this information. Clearly much work has been done. I however would like to point out that the description for the boundary is incorrect. Eek, thanks Mr Furbert…..we removed, will fix in morning..